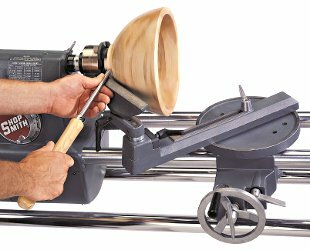 Massive, 35-pound Universal Lathe Tool Rest Will Do More to Improve Your Lathe Turning Results Than Any Other Tool You Might Buy ! Shopsmith's Universal Lathe Tool Rest is the most stable, most versatile lathe tool rest you'll find anywhere -- period! Its unique triple-jointed design lets you swing the arm and support in any direction to position your tool rest deep within the deepest bowls, vases or goblets - even around the back side of large diameter faceplate or chuck-mounted turnings. Weighing-in at a full 35 pounds, this heavy, cast iron tool rest system gives you all the rock-solid lathe tool support and reach you'll ever need. You'll quickly "hog-out" huge amounts of waste or deliberately and delicately produce intricate designs with equal ease and assured, super-smooth results every time. No more annoying vibrations, chatter or tool rest flexing. Whether you're turning with a faceplate, chuck or between centers, the added mass and adjustment flexibility of this system will make a big difference in your turning results from now on. simply remove your Mark 7 or Mark V's work table from the table carriage, set the 10" diameter by 1" thick cast iron mounting plate on top of the carriage, tighten the two bolts and go to work. A quick twist of the locking lever loosens the 18-1/4" long support base arm. Rotate it a full 360-degrees, move it left or right and lock it firmly at any point along its 7-3/8" of travel. 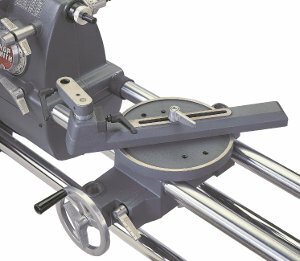 Slip the rotating tool support arm into the support base arm and lock it into position with another quick-acting lever. The rugged 1" diameter steel post in the support arm gives you a full 2-1/8" of up-down travel... allowing you to position Shopsmith's standard tool rest anywhere from 1/2" below to 1-1/2" above your work-piece centerline. An adjustable stop collar and height setscrew let you return to a pre-set height instantly. Any of the four available Shopsmith tool rests (or our Lathe Steady Rest) lock into the tool support arm with a convenient third lever. Includes: • 10" diameter by 1" thick cast iron mounting base with precision machined support base bearing surfaces • Rigid, 18-1/4" by 1-3/8" by 2-1/2" Cast Iron Support Base Arm with a 7-3/8" travel slot for wide-ranging adjustments • 4-3/8" by 1-1/2" Steel Tool Support Arm with 1" diameter steel mounting post and adjustable depth-stop collar • Three Locking Levers for quick adjustments without tools or wrenches • and all necessary mounting hardware. Get the Shopsmith Universal Tool Rest System along with 3 specialty tool rests. With these rests you'll enjoy better chisel control and results. The S-Shaped rest lets you reach 4" deep into a bowl. The 90° rest allows you to make flowing continuous cuts from outside to inside surfaces. 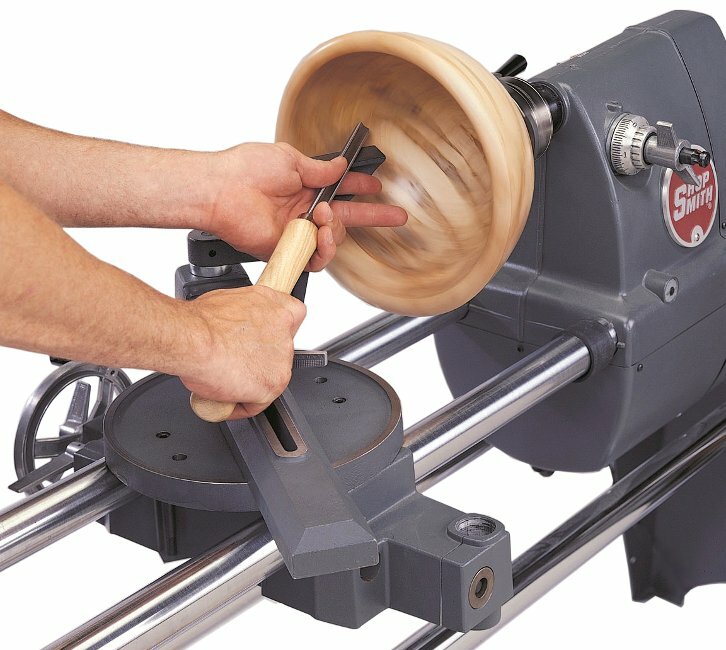 The 4" rest is great for smaller turning jobs and allows you to get in closer to deep coves. 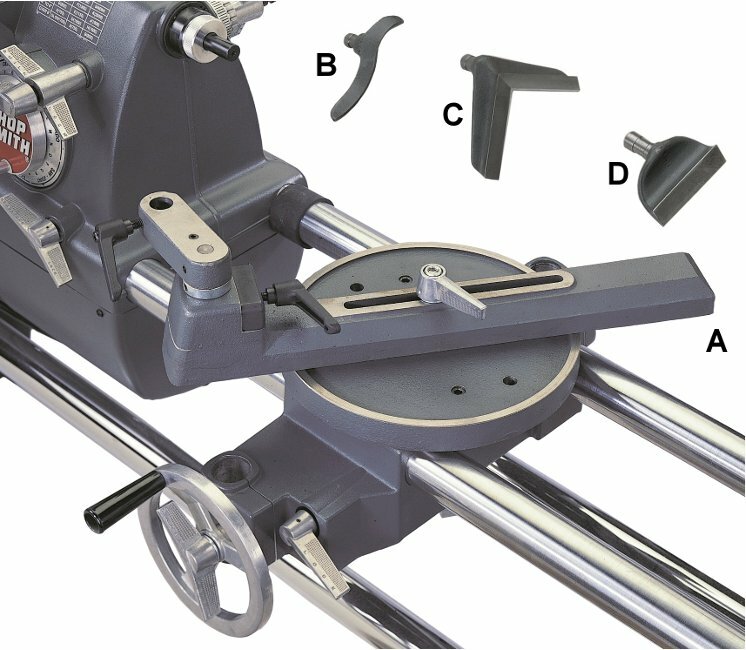 Includes: (A) 555811 Universal Lathe Tool Rest System • (B) 555312 S-Shaped Lathe Tool Rest • (C) 555313 90° Lathe Tool Rest and • (D) 555314 4" Lathe Tool Rest.